What is Organika Amla (Indian Gooseberry)? Organika Health Products Amla is a supplement that is formulated to aid in digestion and relieve any constipation you might experience. This product comes in capsule form and relies mostly on Indian Gooseberry to accomplish its desired effect. 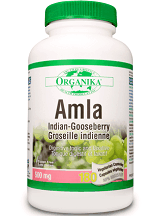 The only ingredient that Organika Health Products Amla uses is 500mg Indian Gooseberry. This is a natural ingredient that helps give your digestive tract a boost, and will subsequently put an end to any constipation in a gentle fashion. If you are a vegetarian, or can’t eat meat for any medical or other reasons, then don’t worry: This product is completely vegetarian. If you are experiencing constipation, or simply want to promote the health of your digestive system, begin by taking two to four capsules three times per day. You should take Organika Amla no less than two hours before you are to take any other medication, supplement, or vitamin. You should not use this product for longer than one week. Keep in mind, you will not experience immediate relief of constipation. It could take as little as six hours, but it is more likely to take twelve. Prices for this product vary, depending on where on the internet you purchase it. The average price is, approximately, $18, though it can be purchased for less. You’ll generally get around 180 capsules for this price. Organika Health Products recommends that women who are pregnant or breastfeeding should consult with their general practitioner before you start taking Amla. You should also speak to a doctor if you begin experiencing nausea, abdominal pain, or vomiting. These side effects could be a symptom of something worse. Also, if taken without the amount of water recommended, it won’t relieve constipation, and can actually make it worse. The company that produces Amla has no satisfaction guarantee, nor a money-back guarantee. It does, however, explain in depth how high-quality their ingredients are, and how they are used. Organika does claim that it is completely vegetarian, free of all gluten, sugar-free, has no egg, no artificial preservatives, no yeast, no dairy, and no artificial colorings. This is great for someone who wants an all-natural digestive supplement. There were few reviews to be found; most were a mixture of both very good and very bad. Organika Health Products Amla is a completely natural supplement. It is completely vegetarian and gluten-free. It is also up-front with the limitations and side effects of this supplement. It comes in a convenient capsule, as well. It claims to aid in digestion and offers dosages that depend on whether or not you are trying to relieve constipation, or if you are just trying to maintain digestion health. However, it has no guarantee as to whether it will work, and offers no money-back guarantee, either. If not taken properly, it can actually make constipation worse. This product is probably a gamble, and you should consider carefully before taking it.